"A murder mystery worthy of a Steve Jobs keynote presentation." "Keith Raffel's debut novel is a great read. Although the book is fast-paced, each of his characters is distinct and well-developed.... Set aside a day to read this book -- once you start it, it's hard to put down." "Dot Dead: A Silicon Valley Mystery may be Keith Raffel’s first novel, but he knows a thing or two about grabbing a reader’s attention." "[W]ithout question the most impressive mystery debut of the year." "Raffel offers an insider viewpoint on the siliconization of the Valley of Heart's Delight. Those who don't live here can enjoy the mystery and the sense of place. Those who do live here will enjoy a drive past many familiar places on their way to solving the crime." "This book is a pleasure, and it was especially fun to read about Palo Alto from the perspective of a smart person who grew up there, who can still remember it at its best, before its charm began to erode under the unrelenting pressure of the big-money MBAs who followed the scent of high-tech money and who now tailgate each other at high speed down Oregon Expressway, hurrying, hurrying toward the next hoped-for big deal." "Dot Dead is a fast-paced, twisty ride. I never knew Silicon Valley was such a scary place." "...Raffel's debut mystery is an entertaining look at the underbelly of Silicon Valley, one with enough twists and turns and likeable characters to hope for more. I especially appreciated the look at the Bay Area's Jewish community, handled with a light touch for color instead of detracting from the story." "I’ve known Keith for years as a smart technology guy, and now I’ve discovered him as a convincing, talented writer. Pick up Dot Dead if you’re looking for a delightful vacation from the rigors of your Silicon Valley life." "The breakneck pace, intriguing characters and snappy dialogue of the Silicon Valley world that Keith Raffel knows so well hooked me. If you can, get a take-out order of Mandarin Gourmet's broccoli beef and cashew chicken and prepare to stay up all night reading Dot Dead." 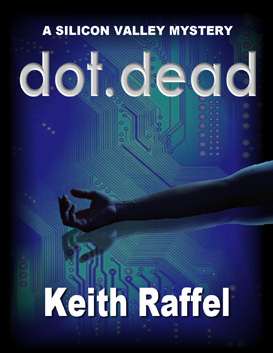 "Keith Raffel's expertise in the computer field plus his ability to compose a terrific story combine to make Dot Dead a spellbinding novel, with a protagonist you won't want to leave...."
"Dot Dead is a fast paced, truly witty mystery set in the maze and madness of Silicon Valley. Ian Michaels is a determined and often befuddled hero who must navigate around a delightfully opinionated Jewish mother and solve a murder while finding love. This is a fun read."